An-70 is designed and built by Antonov ASTC. An-70 performing its maiden flight. The aircraft can climb at the rate of 24.9m/s. An-70 can take-off and land on concrete and unpaved airstrips. An-70 is the first large aircraft to be powered by propfan engines. Antonov An-70 is powered by four Ivchenko Progress D-27 three-shaft propfan engines. 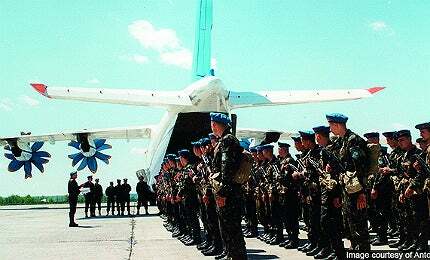 An-70 can carry 300 troops. The An-70's airframe constructed with composite materials. Antonov An-70 is a four-engine medium military freighter aircraft designed and manufactured by Antonov ASTC of Ukraine. The short take-off and landing (STOL) capable aircraft is being built to replace the company’s An-12 Cub transport aircraft. It is the first large aircraft to be powered by propfan engines. Two An-70 prototypes have been built to date. The An-70 has three variants, including the An-70T, the An-70TK and the An-112KC. The An-70T is a cargo transport plane principally used for commercial applications. The An-70TK is a twin engine passenger or freight transformable aircraft. The An-112KC is an aerial refuelling model used in the KC-X programme for the USAF. "The An-70T is a cargo transport plane principally used for commercial applications." The Ukrainian Air Force ordered five An-70 aircraft in November 2005. The fuselage of the first serial production aircraft was completed in December 2012. Deliveries are expected to begin in 2013. The Russian Air Force ordered 40 An-70s in June 2010. Deliveries are expected to begin in 2013. Five An-70s will be procured by Volga-Dnepr airlines. Antonov signed a contract with the Czech Republic in 2005 to supply three An-70 military transport airplanes. Russia and Ukraine are planning to procure 165 and 65 An-70 aircraft respectively during the next 20 years. Russia may purchase An-70 freighters in 2013 based on the success of flight tests to be conducted in 2013. It is currently operating a fleet of An-12 Cub, IL-76MD and An-124 transport aircraft. The development of An-70 began in the 1990s and the first prototype was rolled out in January 1994. The maiden flight of the first prototype occurred in December 1994 in Kiev, Ukraine. It crashed in February 1995 during a mid-air collision that took place with an An-72 chase plane. "Russia and Ukraine unveiled a decision in June 2000 to build a Chinese An-70 version with co-operation from China." Antonov launched the second prototype in December 1996 and its maiden flight took place in April 1997. The prototype was showcased at the Moscow Air Show in August 1997. The second prototype also endured damage in January 2001 due to an emergency landing. Russia and Ukraine unveiled a decision in June 2000 to build a Chinese An-70 version with co-operation from China. 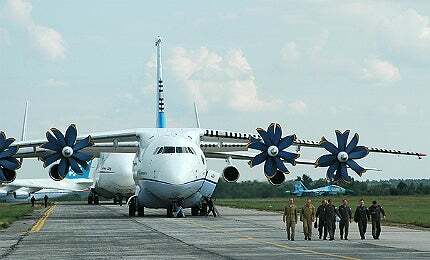 The two nations jointly financed the development of An-70 in 2002 as part of a 50:50 risk sharing deal. The Chinese version was displayed at MAKS Air Show held in Russia in 2003. Russia, however, withdrew from the project in April 2006, due to financial crisis and rigid political relationships between Russia and Ukraine. China and Ukraine jointly built the An-70-600 in 2008. In August 2009, Russia signed a deal with Ukraine to renew its plans to fund the An-70 project. Russia offered $11m in December 2009 and is planning to invest an additional $96m. The user testing of the aircraft took place in August 2010. Antonov transferred the design documentation to Russia for commencing the production at Kazan aviation plant. The An-70 was designed to take-off from and land on concrete and unpaved airstrips including soft ground and snow. It can manoeuvre day or night in bad weather conditions. "In August 2009, Russia signed a deal with Ukraine to renew its plans to fund the An-70 project." The airframe is constructed with composite materials to reduce the overall weight of the aircraft by 20% to 30%. The aircraft boasts a large freight compartment for cargo storage. The compartment is 19.1m long, four metres wide and 4.1m high. It can accommodate 35,000kg to 47,000kg of cargo and 300 troops. It can also carry 38,000kg of fuel. The An-70 features a spacious glass cockpit which can accommodate the three crew members – pilot, co-pilot and flight engineer. The cockpit is fitted with six full colour digital displays and a head up display, which aids the aircraft’s landing on short airfields. Automated navigational and flight control systems are incorporated for quick analysis and servicing. The Antonov An-70 is powered by four Ivchenko Progress D-27 three-shaft propfan engines. Each engine can produce 10,350kW of output power. FADEC compatible, the D-27 engine is fitted with two remote gearboxes, a single stage compressor, a four stage low pressure turbine and a jetpipe. The engine is 4.19m long, 1.25m wide and 1.37m high. Its dry weight is 1,650kg. The lifespan of the engine is 18,000 hours. The incorporation of SV-27 counter rotating propeller in the power plant increases cruise speed as well as reduces the fuel consumption by 20% to 30% as compared to modern turbojets. The aircraft features four overhead rail electric motor hoists to lift 12,000kg of cargo. Two on-board electric winches can lift 30,000kg of freight. A built-in aerial delivery system allows autonomous loading or unloading of cargoes and can be used for air drops. The An-70 can climb at a rate of 24.9m/s. The maximum and cruise speeds of the aircraft are 780km/h and 750km/h respectively. The stall speed is 113km/h. The range of the aircraft is 6,600km, while the ferry range is 8,000km. The service ceiling is 12,000m. The An-30 is a twin-engine, surveillance aircraft designed and manufactured by Antonov Design Bureau of Ukraine principally for the Soviet Air Force to execute cartography and aerial survey missions. The An-32 is a twin engine, tactical light transport aircraft designed and manufactured by Antonov Design Bureau of Ukraine for the Indian Air Force (IAF).